Take the anxiety and stress out of your dental visit with our sedation dentistry treatment. Find out how our sedation options can make your dental appointment a breeze. While many people tend to associate dental visits with nervousness or pain, we can take the fear out of dental visits for even the most anxious of patients using the modern advancements in dental sedation available at Beverly Hills Aesthetic Dentistry. When you come into our office for an appointment, Beverly Hills and Santa Monica sedation dentist Jonathan Rudner can discuss your dental fears with you and recommend a sedation dentistry treatment that will allow you to receive the treatment you need without experiencing undue anxiety. In fact, due to the deep state of relaxation induced by dental sedation, we can even complete several visits’ worth of dental treatment in only one visit and cut down on your time spent shuttling to and from our office. 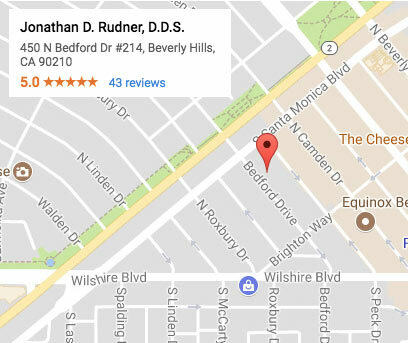 When you schedule a sedation dentistry treatment at our Santa Monica and Beverly Hills-area office, sedation dentist Jonathan Rudner will provide you with medication that will relax you before your dental work begins. While you may not be fully unconscious, you will experience a deep state of relaxation and you will not suffer any significant anxiety, pain, or fear. You may even sleep through your treatment! During your appointment, you will be monitored at all times by Dr. Rudner and members of our highly trained staff to ensure your safety. Afterwards, you will likely recall few details of your treatment, and you will have a rejuvenated, healthy smile that you’ll be proud to call your own.